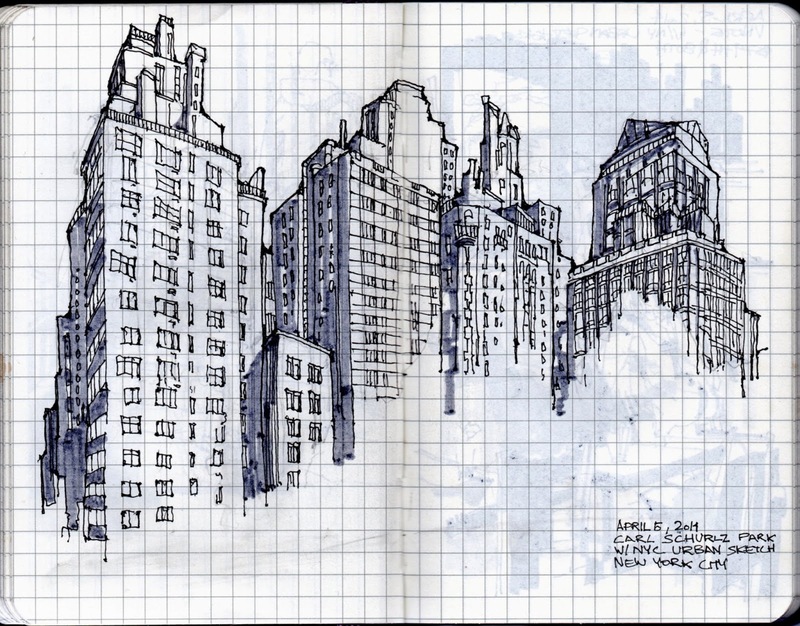 A productive day of sketching last Saturday with the sketchers of NYC. We started off at the Carl Schurlz Park in Upper East Side. 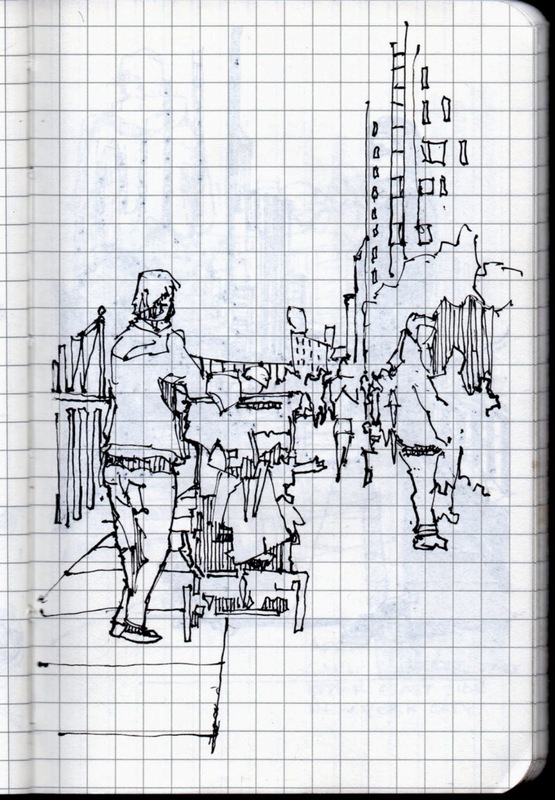 When I can't decide what to sketch I usually find a vanishing point and try drawing people to warm up. I was having some trouble with the pen. 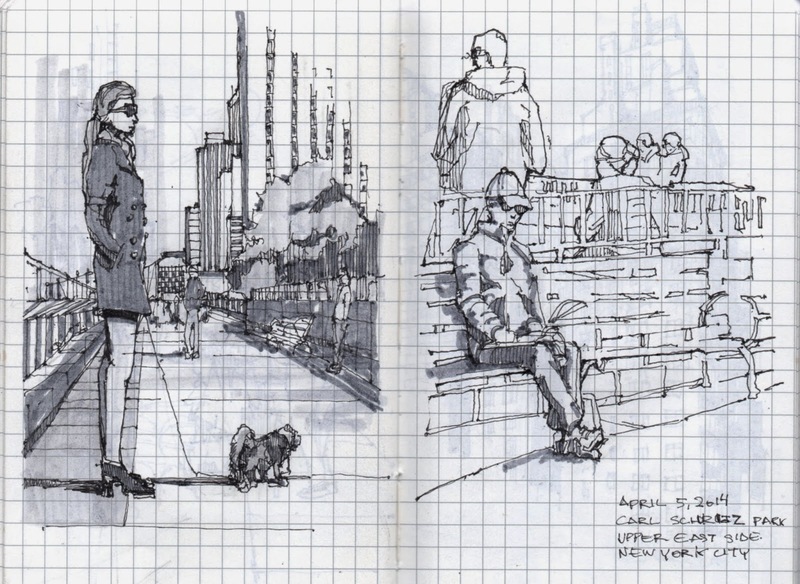 While sketching this lady came and stood in front of me with her dog. It looked like she was going to stand there for a while so I quick turned the page and drew a fast outline of her. She stood there for about a minute and I tried filling in the details from memory and used the same perspective from the previous sketch. I'm much more confident sketching architecture than people so I drew the apartments that overlooked the park. Unfortunately we couldn't find a nice enough view of the Gracie Mansion to sketch it. 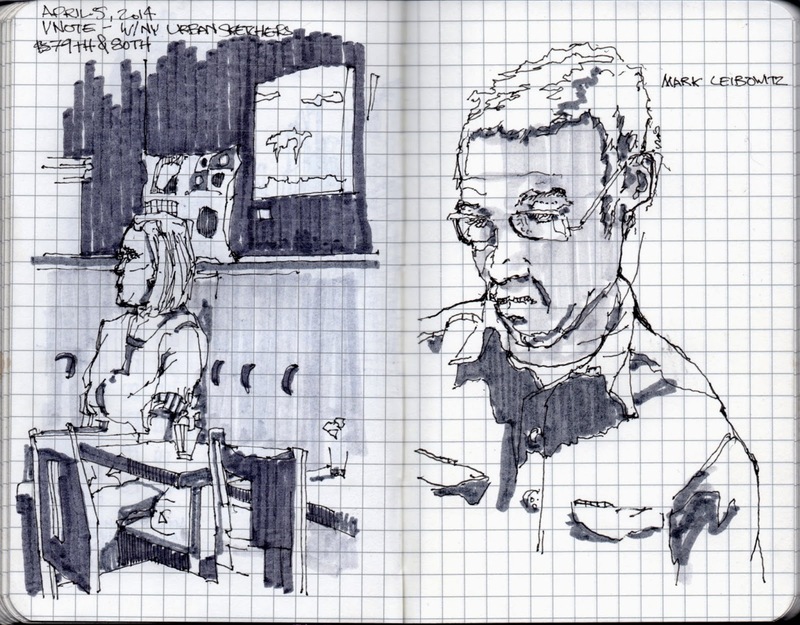 Once finished at the park we went to a restaurant and I chose to attempt drawing more portraits. After we were done at the restaurant I still had a few hours before dark. 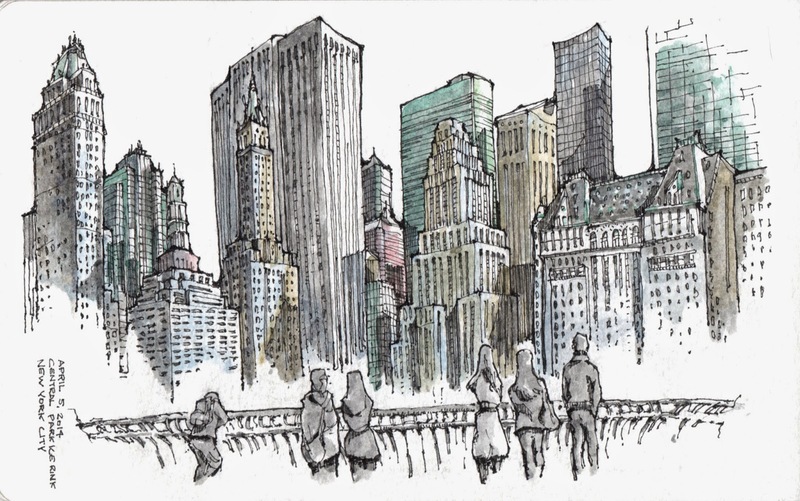 I've always loved central park and the rows of sky-scrapers that line it. I'm always astounded by how tall these buildings are. This is a picture a quarter way through the drawing. I drew until it was dark and finished some of the inking and watercolor at home later that night. Josiah, you may feel more comfortable doing architecture, but your figures are great and add so much to the sketches. I love that one of the lady with the dog and the last one with just tints of color. It was a great day of sketching. Thank you for your kind words, Joan! 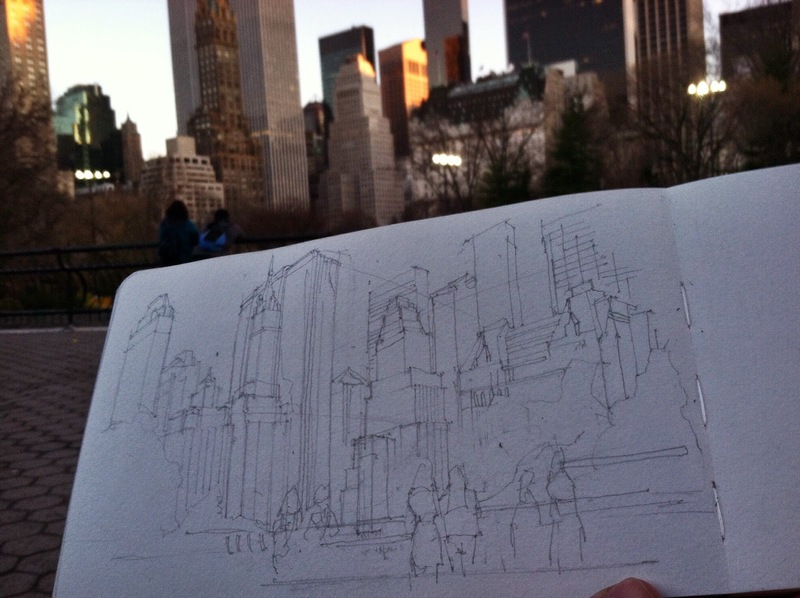 Y hay que tener mucha paciencia y habilidad con el dibujo para dibujar cualquier perspectiva desde Central Park. Gracias! Si, era dificil encontrar un lugar para enfocar.